Mirrors in gyms initially seemed like a strange concept to me. I remember when I was in high school and we exercised in a gym that didn’t really have many mirrors so this wasn’t a topic that was discussed very often. However, as I got older and joined a commercial gym, I realized that mirrors are everywhere. Many people when first beginning at the gym can be intimidated by all the mirrors. This is completely understandable and definitely can be tough to overcome initially. 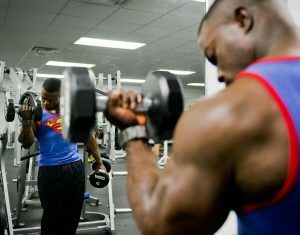 So what is the purpose of mirrors in the gym and why do many commercial gyms line the walls with them? Can you use these mirrors to your advantage or are they just there to make you feel uncomfortable? I have a couple answers for you.. In fact, you may be shocked at one main reason behind the mirrors. When you first enter a new gym what are some important aspects of the facility you look for? Types of equipment– this is important to me because I know the types of workouts that offer me the best results and therefore I know what types of equipment I’d like to see in a gym. Quality of equipment– quality is important. You know if a gym doesn’t take care of their equipment or purchase higher quality equipment then they likely don’t care to retain their members. 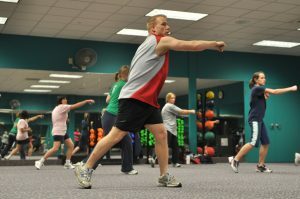 Culture of a gym– if people seem stand offish or rude, chances are that may be the culture in a gym. While I don’t necessarily believe in generalizing, I do enjoy a friendly open gym environment. Size and open space in the gym– I always like to see that there is plenty of space for everyone to perform their lifts or calisthenics. If there is the right amount of equipment, then there needs to be the right amount of open space for people to stand, stretch, or lift. The last one leads me to my main point of this section. Open space. Open space is generally important because not many people like to stand elbow to elbow with other people in the gym. Limited space in a gym can create additional or unnecessary stress for many. So one main reason for so many mirrors is illusion. Walls full of mirrors create the illusion that the space is extremely open and inviting. Many commercial gyms use this as a tactic to draw in customers. Even when a gym is smaller and lacking square footage, you may not realize how much space the gym is lacking if there are countless mirrors in that space making the floor plan seem more open. Although many corporate gyms use mirrors as a psychological tactic for the facade of open space that doesn’t mean that mirrors can’t be used positively. Mirrors can be beneficial once you become more experienced with lifting. As you progress and become more familiar with lifts or exercises you will become more concerned with your form. I personally use YouTube and diagrams as resources for proper form quite often. The problem is that these outlets don’t give you a first person perspective on form. This is where the third person view through the use of mirrors can be beneficial. When you are able to compare your form to that which you are modeling, it greatly helps with reducing improper stance, poor posture, and helps to eliminate bad habits you may have subconsciously adopted. Since improper form can lead to injuries, form is probably the most important aspect of your workout. If you want to avoid heavy setbacks in the gym, you need to avoid injury. Proper form goes hand in hand with stretching as I talked about here. How Can Beginners Overcome Intimidation? It has been proven by multiple psychologists that beginners can be intimidated by mirrors in the gym. In fact, one particular study published by The Journal of Health Psychology showed that a majority of beginner lifters, whether confident in their body or not, had at least minor concerns when forced to exercise in front of a mirror. This leads back to the beginning of this article when I referenced commercial gyms interest in attracting new members. If beginner lifters are deterred from a gym with an abundance of mirrors then are these gyms really concerned about bringing in beginner lifters, or just those with more experience? The interesting part is that beginners in the gym tend to focus more on their body image than form, while experienced lifters have trained their minds to ignore body image and focus more on lifts and exercises. One piece of advice from psychologists to beginner lifters is to attempt to shift your focus to the latter rather than being concerned about your overall body image. I personally believe that paying attention to your body image can be important as long as you use it for positive. If you are able to notice gradual changes in your body from week to week, mirrors can actually inspire you to keep returning to the gym. Just try to remember that you are not being judged, and you are your own worst critic. It has been suggested that gyms provide beginners a comfortable area to exercise with less or no mirrors present until you become experienced enough to use mirrors for attention to form. This may be a good tactic to ease new members into a large gym when they are initially uncomfortable. However, this could hinder experienced gym members experience and may not be the best idea. You may be wondering if mirrors are beneficial or not. That is for you to decide. Everyone uses mirrors in the gym for different purposes. Whether you are a beginner or an experienced gym goer mirrors may have their benefits. I personally suggest putting them to use no matter your level in the gym. They have helped me avoid injury quite a few times. More often than not I catch myself lifting too heavy because I realize I have a lapse in my form. If you are uncomfortable with the mirrors, try avoiding them or moving to a central area and focusing on the lift you are performing rather than what you look like. If you hate mirrors or love them, I’d like to hear about it in the comments below. Please share your experience. If you have any tips for beginner lifters, or maybe you are a beginner and have questions… Feel free to ask! I am surprised that many people that are beginners have body issues especially when a mirror points it out. I can only guess that they are afraid of being judged by other members which is probably not the case considering they are concentrated on their workouts. Do you see judging of other unhealthy people also part of gyms with bad cultures? I think it’s tough to break into any new area. Especially when your lifestyle hasn’t included it in the past. I know many people that just don’t really know where to start, and having a negative body image definitely doesn’t help. I think the biggest struggle people have is seeing their self in the mirror and seeing their self in a positive light. If someone is out of shape, usually they know they are out of shape. Since it takes so long to see change it is tough for them to stick with the gym, and I don’t think mirrors tend to help that. I don’t see much judging, and usually experienced gym goers are there to help. They may seem rude, but usually they are just in their own world working out or translating their every day stresses into their workout. I think that presents a whole new topic and a whole new struggle for beginner lifters that should be discussed. I do agree that a gym with a bad culture can perpetuate that culture through looking down on beginners or those with self esteem issues. However, positive and uplifting environments exist, it might just take some time to find one. Thanks for reading! I appreciate the questions. I had no idea that’s why they put all those mirrors in gyms. With all the advantages they give I can see why so many gyms use them. Along with all the reasons you gave, I also believe gyms use a lot of mirrors because they have big rooms and it is expensive to light up the whole room and so mirrors can reflect that light and off into the room again to create more light. It is also great to see that you encourage mirrors to help people be mindful and work on their body image. I really appreciate that perspective actually. I never thought about the cost effectiveness of using mirrors to light the areas. Yes! I think that they can be really beneficial to people trying to focus on the details of their workouts. Hey Dalton. This is an great article. I have to say I have always wondered why gyms had mirrors. I thought it would be so you could watch your self for accuracy. But it is very interesting to see they add mirrors for many other reasons, like adding the illusion of more space. I also like how they use this to allow you to see yourself and how you are changing over time. Great concepts thank you for sharing your findings. Thanks for stopping by to give this article a read. It sort of is an obscure fact that people always wonder but never actually try and find out. I think we often just go about our daily lives without giving it much thought. I definitely know that it helps me with form, and over time ideally you can see results looking in the same mirror every day. I prefer a gym with fewer mirrors. I don’t like to look at myself working out and feel like others may watch me and judge. As far as the form part of the workout, yes it’s the most important part and can help to watch if you are comfortable. I used to have a trainer so I focused more on his instruction than the image. Mirrors giving the illusion of a larger space makes sense, they do that for small houses too. I know sometimes it can be discouraging to see yourself in the mirror, especially when you haven’t seen the results you are looking for right off the bat. The only advice I can really offer is to keep working hard and eventually your self confidence will increase a bit. Just know and understand that every day you walk in the gym you are moving in the right direction towards results. It’s simply the tree chopping analogy. If you take one swing at the tree every single day it may not fall the first day, but eventually it will happen. The same goes for working out. Results will come. The small house concept is a great idea also. I’ve used that before in some of the apartments I’ve lived in to make them feel more spacious.